After the fall of the Low Countries in June, Hitler commanded the SS to forming SS 'Westland' Regiment, a formation for Dutch and Flemish Belgian volunteers. The recruiting standards of the SS 'Westland' remained identical for both foreign and German applicants. 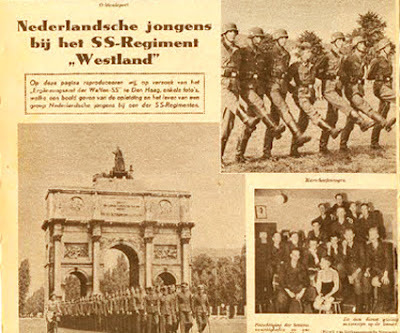 Dutch and Flemish men, between seventeen and forty years of age, who could establish Aryan racial characteristics, attest to good health, and meet the minimum SS height (165 cm) would enlist in the SS 'Westland' Regiment for two to four years. When Hitler ordered a slight expansion of the Waffen-SS, parallel to the spring 1941 Army expansion program for the coming offensive against the Soviet Union, SS 'Westland' Regiment became one of the infantry regiments of the new SS 'Wiking' division. The commander-in-chief of the ‘Wiking’ was SS-Brigadeführer Felix Steiner, one of pan-Germanic or European champions among Waffen-SS leadership. Originally it was designated SS-Infanterie-Regiment ‘Westland‘ before renamed in November 1942 as SS-Panzer-Grenadier Regiment ‘Westland‘. By November 1943 it was finally designated as SS-Panzer-Grenadier Regiment 10 ‘Westland’. The first regiment commander was SS-Obersturmbannführer Hilmar Wäckerle, a former Dachau commander. ‘Westland’ saw action when 'Wiking' entered the war against Soviet Union. The division was placed in the Heeresgruppe Süd that received orders to conquer the Ukraine. 'Westland' lost its commander during the very first operations in enemy territory. On July 2nd 1941 SS-Standartenführer Hilmar Wäckerle was shot in the back by a Russian sniper while inspecting captured Russian weaponry and died. The next day, a company of 'Westland' took revenge and the village that had possibly hidden the Russian sniper received 'Vergeltungsfeuer' (reprisal fire) from the SS-soldiers. Wäckerle was succeeded by Oberführer Artur Phleps and the regiment keeps fighting with the remaining division. ‘Westland’ encounters heavy resistance and suffered heavy losses: in the end of the July 1941, they lost 10 officers and 82 other ranks who were KIA, while 360 others wounded. The 'Westlanders' now knew for sure that the Red Army soldiers were prepared to defend their country at all costs. On November 5th 1941, the regiment crosses the Mius River and advances north-eastwards towards Perwomaisk-Oktjabrisk, in order to reach the road to Astachowo. However, the Russian counterattacks towards the end of the month, including used a massive fire concentration with 'Stalin Organ', forced ‘Westland’ withdrew to the Mius. It was the hardest for the troops in the frontline, ground frozen to a depth of one meter with no winter clothing yet so they improvised. Their dugouts were about one meter high in the days of December 1941 and January 1942. Temperatures dropped to minus 40° C. According a report by Phleps, the regiment lost nearly 50% of its original strength within five months. When spring 1942 arrived, Phleps leaves the regiment to take over a new SS mountain division, 'Prinz Eugen'. He is succeeded by at first SS-Obersturmbannführer Berthold Mack and later SS-Obersturmbannführer Paul Geiβler. Two battalions of ‘Westland’ were left in the Mius positions, while the third one was withdrawn into the Amwrosijewka area for some rest and re-fitting. ‘Westland’ participated during the German summer campaign of 1942 against Caucasus. They were strengthened by a battalion of Estonian volunteers. During the end of September and early October 1942, reinforced with a panzer battalion, ‘Westland’, with other ‘Wiking’ regiments succeed to taken the mountain strongholds of Ssagopschin and Malgobek after a heavy fighting. However, the campaign in Caucasus ended when the Red Army threatened to cut off German forces operating in southern Russia after encirclement of the German 6th Army in Stalingrad during the winter 1942–1943. SS Division ‘Wiking’ was one of the first formations to be withdrawn to bolster the retreating 4th Panzer Army, entraining from 24 December for transport to Remontnaya, arriving there on 31 December. The division fell back through Zimovniki, Proletarskaya (holding open the bridge over the Manych), Zelina and Yegorlykskaya towards Bataisk and Rostov, finally escaping through the Rostov gap on 4 February. ‘Westland’, and the remaining ‘Wiking’ Division later participated during the Third Kharkov Battle, where they were held off the Soviet assault, protecting the vital rail line and helping bring about the destruction of Mobile Group Popov. During this battle, SS-Sturmbannführer Erwin Reichel, the new regimental commander was killed. He receives the Ritterkreuz posthumous for his actions. He was replaced by SS-Obersturmbannführer August Dieckmann. After the recapture of Kharkov, ‘Wiking’ was pulled out of combat to be refitted as a Panzergrenadier division. ‘Westland’ lay as army reserve in Slawiansk. While the Operation Zitadelle was in effect, several Soviet formations attacked towards Orel and Kharkov simultaneously. The ‘Wiking’ was engaged against the forces near Kharkov. A battalion of the ‘Westland’ followed Kampfgruppe Dorr into Ssrednij. Russian counter-attacks were unsuccessful, but two weeks later they succeeded in creating a gap of 10km deep and 12km wide break-through. During August 1943, ‘Westland’ moved into the area north-west of Kharkov and fought its eastern flank to the edge of the woods south of Olschany. Failure to stop the Red Army in Kharkov and Kiev, ‘Wiking’ Division engaged in defensive battles on the Dnieper River. The ‘Westland’ crossed the wide river in the Tscherkassy area, where it had already fought in August 1941, and fought heavy battles to capture the Russian bridgehead over the Dniepr, north of Kanev. The regiment suffered a great losses, including the death of Dieckmann, theirs commander, before they finally succeed to thrown back the Red Army to the east bank of the river. After the bloody battle in Tscherkassy, the remaining ‘Wiking’, including ‘Westland’, survivors reorganized and grouped with the 3. SS Panzer Divison ‘Totenkopf’ under the IV. SS Panzer Korps command. They were served in Poland and Hungary, fought desperate battles against the Red Army juggernauts. The remaining ‘Westland’ survivors surrendered with rest division to Soviet troops in May 1945.